Mesoscale sea surface temperature (SST) variability plays an important role in shaping local atmospheric boundary layers through thermodynamic processes. 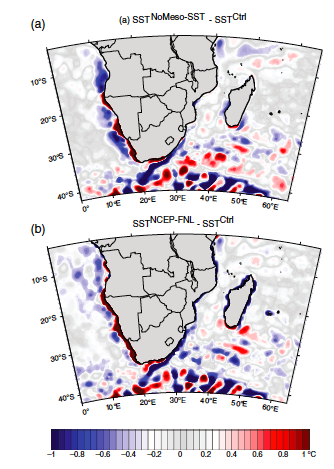 This study focuses on the upscaling effects of mesoscale SST gradients in sensitive areas on the southern Africa regional atmospheric circulation. Using regional atmospheric model sensitivity experiments which differ only in the mesoscale SST forcing characteristics (either the full spectrum of SST variability or only its large-scale components are included), we first quantify the importance of SST gradients on regional atmospheric conditions. Agulhas eddies and meanders influence the vertical air column up to the troposphere, and mesoscale ocean patterns significantly modify incoming landwards moisture fluxes. The austral summer mean state is then modified in terms of air temperature, cloud cover and mean rainfall, with notable differences in tropical rainbands over southwestern Africa. Mesoscale SST variability favours tropical– extra-tropical interactions and cloudband development over the continent. These results stress the importance of high-resolution ocean forcing for accurate atmospheric simulations.